Gouda is a signature cheese of the Dutch and an increasingly popular style made by cheesemakers in the United States. Gouda is aged anywhere from 2 months to five years. The longer it's aged, the more intense the cheese becomes; harder and denser in texture with bold flavors that can be sharp, salty, sweet, nutty and caramelized all at once. The regions of the Netherlands known for producing gouda are North and South Holland, North Brabant and Friesland. North and South Holland have lush, grassy pastures that produce especially rich, high-fat cow's milk. This milk is used for making what is considered the best gouda in the Netherlands. Increasingly, gouda is also being made by many cheesemakers in the United States. What Gives Gouda its Flavor? Many say that the grass cows graze on greatly affects the flavor of gouda. This is why gouda made from the rich, high-fat milk of cows grazing on lush grasses is considered the best. However, other things affect the flavor of gouda as well. For example, an extra step in the cheesemaking process gives Gouda the sweet, butterscotch flavor it's known for. After the milk has thickened into curds, the curds are rinsed with warm water. The temperature of the water, even by a few degrees, can affect the flavor of the cheese. The water thoroughly removes whey from the curds and along with it, lactose (milk) sugar. Removing the lactose means the bacteria has nothing left to feed on and will stop producing lactic acid. Less lactic acid means the cheese will have a sweeter flavor. The flavor of Gouda is also affected by how longs it's aged. The longer Gouda is aged, the sweeter and more intense the flavor becomes. The texture also changes, becoming hard and crumbly and really dense. 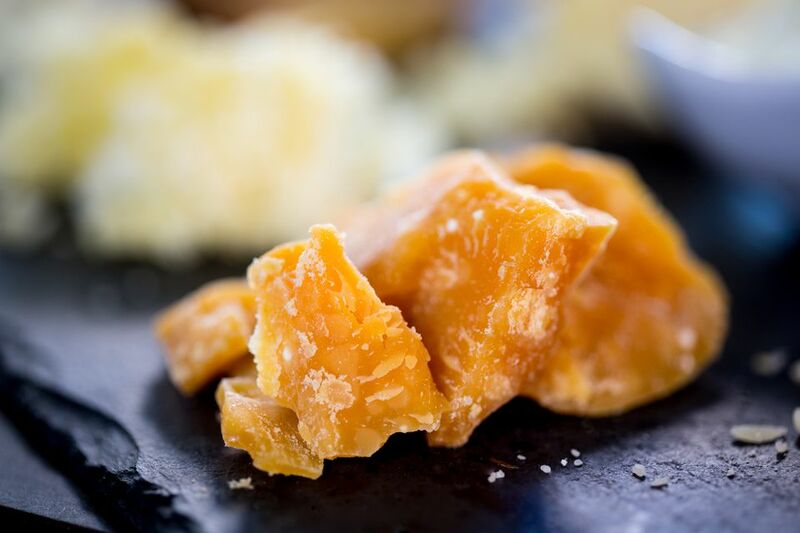 Many aged Gouda's have tiny protein crystals that make the cheese a little bit crunchy. Gouda is typically aged between 2 months and 2 years. Some extra-aged Gouda's are aged up to five years. So, Does Aged Gouda Have Lactose? Because the curds are rinsed to remove lactose and because many types of gouda are aged for so long (removing more moisture (whey) and therefore lactose) gouda tends to have less lactose then other types of cheese. Some cheesemakers claim that their gouda has non-measurable amounts of lactose and is therefore easy to digest even for those with lactose intolerance. What Gives Gouda Its Color? Gouda is colored orange by adding the natural plant-based colorants annatto or carotene. Why Does Gouda Have Small Holes in It? Lactic bacteria cultures that produce CO2 are added to the milk. The CO2 produces bubbles (gas) that creates little holes, or eyes, in the cheese. Boerenkaas is the Dutch word that's equivalent to "farmstead" cheese in the United States. That is, cheese made from the milk of animals who live on the same farm where the cheese is made. However, the word Boerenkaas also goes one step further, requiring that all cheese labeled as Boerenkaas must also be made with raw (unpasteurized) milk. Only a small percentage of Dutch Gouda can be called Boerenkaas. The rest of the Gouda made in the Netherlands comes from dairy co-operatives who pool milk from many farms to make cheese. One well-known Dutch co-op is Beemster, which sells it's Gouda across the United States.